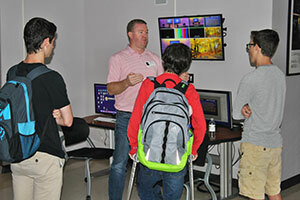 Students listened intently as Brad Cheney, WVHS Class of 1996, spoke with four groups of CTEC Video Production students and communication students about his professional experiences in the television field. 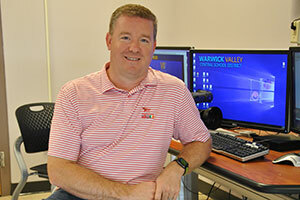 Currently a Vice President of Field Operations & Engineering for Fox Sports Media Group, Brad manages technical and operational planning for golf, baseball, and college sports, along with advanced-technology projects for Fox Sports Media Group. 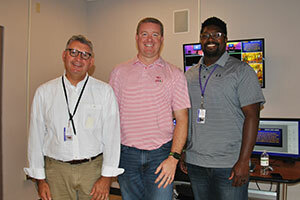 He’s a leader in new technology approaches, including IP-based live and postproduction centers, IP over RF, UHD, HDR, and UAS systems, and his work includes innovative production approaches and executions for in-ground audio, robotic cameras and home run productions. 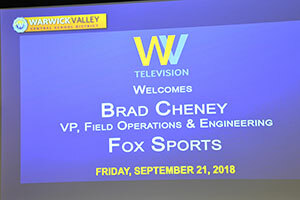 Cheney is a six-time Emmy winner and previously worked for MLB Network, Late Show with David Letterman, Game Creek Video, and COX Sports. 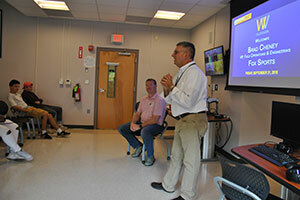 Students appreciated Brad’s real-world perspective on working in the TV/communications field, advice on how to be a valuable employee and the value of networking.